k) the Development of more comprehensive uncertainty estimations in the observation gridding (E-OBS) including an improved method for interpolation. Also the Observation rescue and development (QC) in UERRA is complete and data sets are available at URV and several international data centres as documented in the reports of the data sets and of the data repositories where data have been sent to. 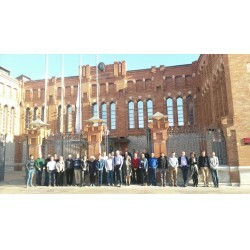 UERRA had its 5th General Assembly in Tarragona. (28-29 November, both full days). Please see the GA 5 page for further information. Please find the latest Agenda and Presentations there. Adjoining this the two concluding workshops were organised, the Concluding 2nd User Workshop of WP8 and then the Synthesis Evaluation Workshop of WP3 (30 November all day for the User WS and Friday morning 1/12. The Agendas are on the User and Evaluation Workshops page. Click (twice) on the image below to see an enlarge view. Please see the Meeting page with further information about the Workshops. SMHI, Météo-France, Bonn University and the Met Office have run or are running their reanalyses in WP2 with the HARMONIE-ALADIN, ALADIN and MESCAN, COSMO and Unified Model systems. The years 1961-2015 exist from SMHI and can be retrieved via the ECMWF data portal. (Or directly from MARS if you have an ECMWF user account). The Met Office Unified Model RRA, including an ensemble, is available for the periods 1979-1990 and 2000-2014 while the remaining 12 years are being produced during the remainder of 2017 and early 2018.and from 1979 and still being filled with data for the 1980s. The MESCAN surface 5 km reanalysis from Météo-France is available for 1981-2010 with the rest being produced and some rerun, all during the autumn of 2017.The 2005-2010 period has been produced at University of Bonn with the COSMO modelling system and also includes an ensemble. 1. HARMONIE Relative humidity at pressure levels and 2m surface level: Humidities that originally were >100% have erroneously been set == 0. Ar least near the surface such 0 values can be assumed to be 100 or supersaturated. 2. HARMONIE sensible heat fluxes only exist for forecasts up to 6 hours and the values are missing over most of the land area. 3. HARMONIE maximum wind gusts since last postprocessing suffer from a significant spin down due to TKE at the start of the forecast so at least the 0-1 hour forecast range has a severe overestimation and should not be used. 4. Overestimation of precipitation can be seen in the HARMONIE evaluation (D 2.7 and D 3.6). Also the Met Office Ensemble has a severe overestimation during the first hours of the forecast range (D 2.14). The schedule of production and archiving can be seen in the GANTT diagram which will be kept up to date. See also a page showing the same plan of finishing production. The Data rescue activities have completed some 8.2 M data that include a lot of the sub-daily scale and almost all of them have undergone extensive quality controls and corrections. A wide range of activities and results are shown in Newsletter No 3 downloadable under Publications.